Hydroelectric dams exploit storage of gravitational potential energy. A mass, m, raised a height, h against gravity, g = 10 m/s², is given a potential energy E = mgh. The result will be in Joules if the input is expressed in meters, kilograms, and seconds (MKS, or SI units). Water has a density of ρ = 1000 kg/m³, so if we know how many cubic meters of water flow through the dam each second (F), the power available to the dam will be P = ηρFgh. We have inserted η to represent the efficiency of the dam—usually around 90% (η≈0.90). The height of the water behind the dam is the relevant height for the potential energy calculation, even if a given parcel of water is collected at the bottom of the dam. This is because the pressure of the water above provides the motive force. In the absence of turbines or other restrictions, the water would emerge from the penstock at a velocity of v = sqrt(2gh) so that a flow, F, would require an area A = F/v. 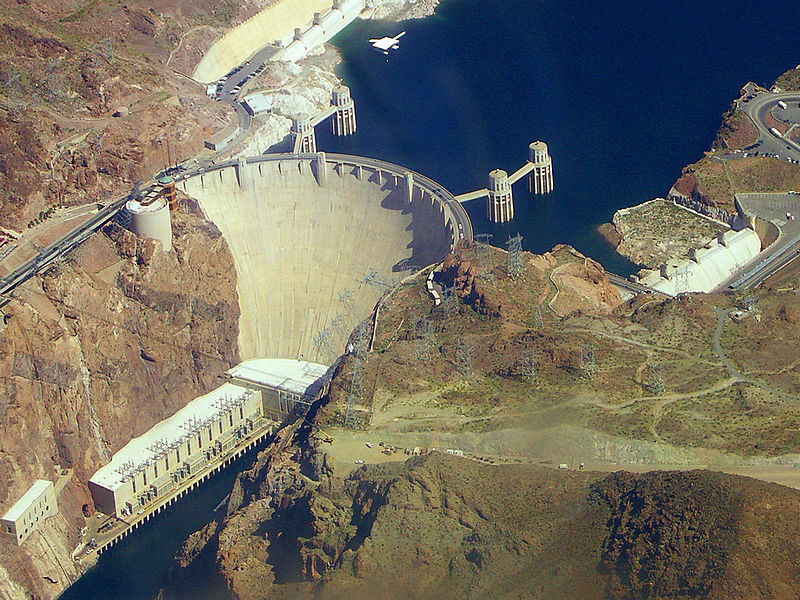 For example, Hoover Dam, at 222 m high (in the days when Lake Mead was full!) would eject water at a stunning 67 m/s (150 m.p.h.) if a big hole opened up in the bottom. At the nominal flow rate of 1000 m³/s, this corresponds to a hole about 4 m in diameter. I think we should do it. Now, it is the job of the turbine(s) to extract some of the kinetic energy this water would have if it were allowed to shoot out of the bottom of the dam. As a consequence, it comes out at a much more sedate pace. Some of the 10% inefficiency in hydroelectric dams is due to generator inefficiency, but some is because you can’t take all of the kinetic energy out of the water or it would stop flowing and stall the flow of the next batch. But nature is kind here, since kinetic energy goes as the square of the velocity. The velocity of the energy-sapped water is therefore sqrt(1 − η). So if we pull 96% of the energy out of the water, its flow velocity is 20% of the free-flow value (13 m/s in the foregoing example). Or we can grab 99% at a 10% exit speed (7 m/s, or 15 m.p.h.). This sounds much more reasonable—and seems like a good bargain. The area needed now expands accordingly, but that’s what large turbines/penstocks are for. The U.S. has 78 GW of hydroelectric capacity installed. In a year, these plants produce 272 TWh. Divide by 8766 hours in a year, and we find 0.031 TW (31 GW) of average power. This implies a 40% capacity factor. I was surprised by this: I thought dams churned along at a steady rate all the live-long day. Seasonal variations are apparently much larger than I appreciated—snow-melt being one factor. The following table lists all hydroelectric facilities in the U.S. bigger than 1 GW—representing 30% of total installed capacity in just 11 dams. The table shows each dam’s nameplate (peak) capacity, height, implied flow at peak generation capacity (after which spillways must be activated; assumes 90% efficiency), and capacity factor. Eight of the eleven dams in the table are in the Pacific Northwest. Of possible interest is the fact that the power-capacity-weighted heights of these dams is 113 m, while for the entire U.S. fleet, it is 88 m (much higher than I thought). For reference, the newly completed Three Gorges dam in China is rated at 20.3 GW, has a nominal head height of 81 m, an implied flow of 28,500 m³/s, and a capacity factor of 0.45. What fraction of our energy currently comes from hydroelectricity? Such a simple question deserves a simple answer. Yet numbers range all over. The hard answer is that 272 TWh of annually delivered electricity in the U.S. corresponds to 0.9% of the primary energy use, or 2.3% of primary energy associated with electricity. Of the delivered electricity, it’s 7.3%. Much of the variation is due to an apples-to-oranges comparison of efficient hydroelectricity to heat engines that convert only 35% of their primary energy into useful energy. For instance, the Department of Energy’s Annual Energy Review (whose numbers are well-depicted in the LLNL graphic) artificially inflates the contribution from hydro to put it on the same footing as the fossil fuel inputs. But however you want to slice it, hydro is on the small side. Now the fun part. How much hydro power is theoretically achievable? Hydroelectricity is cashing in on residual potential energy provided by the rain cycle. 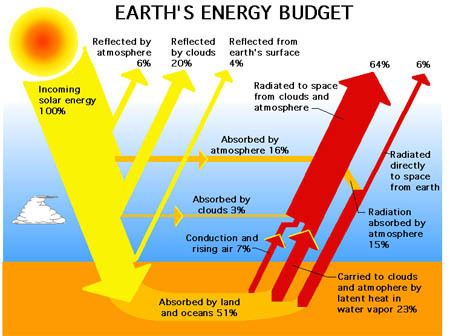 A look at the Earth’s energy budget shows that a whopping 23% of the solar budget goes into evaporating water! The water cycle is a big deal. Each gram of water takes 2250 J of energy to vaporize. It takes additional potential energy to lift the water into the atmosphere. Hoisting a gram of water 10,000 m high (to the top of the troposphere) takes a comparatively small 100 J. Since all water caught by the land and used for hydroelectricity had to first be evaporated, we can say that if all the water got lifted to 10 km (it doesn’t, but bear with me for easy math), then 1% of the solar budget goes into lifting water. I love it when numbers like 2250 J align so neatly with 23% of the solar budget! The lower atmosphere contains far more water than the upper atmosphere—largely because air gets cooler with altitude, and can hold less water. But clouds represent condensed water and can clearly contain significant amounts of water all the way up to 10 km. If water were evenly distributed in the troposphere, the average height of water within it would be about 5 km. Considering the non-uniform profile, I’ll use an average height of 2 km. Therefore, we adjust our hoist factor to 0.2% of the incident solar energy. Then it rains. And most of that stored energy is wasted as the drops fall irresponsibly through the sky—without a thought to our needs. When water hits the ground, the average height of the land is—I’m guessing—500 m. Since potential energy is linear with height, we can use a simple average in this way. If we could capture all that remains of the potential energy as we return the water to the sea, we get 0.05% of the solar potential. But this only works on land, which is 28% of the Earth’s surface. Now we’re down to 0.014%. Don’t despair yet. The solar potential is huge. These percentages all relate to the incident energy at the top of the atmosphere: 1370 W/m² over πR² square meters turns into 175,000 TW. So our 0.014% is 25 TW. Our global energy diet is about 13 TW, so we’re in the game. We can pursue an alternate approach to check that we’re on the right track. If annual rainfall averages 0.5 m (20 inches) on land globally, and typically falls on land 500 m above sea level, we can total up the potential energy and divide by the number of seconds in a year to get a power. I calculate 11 TW by this method, so yes—we’re making sense. My guess of 0.5 m of rain per year may be a little low, but perhaps this compensates a bit for the fact that low areas tend to get more rain than high areas. Now, nature provides a convenient water collection system, concentrating the water that falls on land into streams and rivers and lakes. This natural concentration is what makes such a diffuse power source usable at all, and is why hydroelectric was the vanguard of modern renewable energy (I’m skipping over firewood as non-modern). But as convenient as this collection system is, much of the energy is lost en-route to the rivers. Think about the journey a water drop that lands in your yard or on a mountain slope must make before finding a body of water large enough to profitably dam up. Obviously there is friction in the collection process, or water would be screaming along at 100 m/s (220 m.p.h.) at the bottom of a 500 m slope. In the end, we must accept heights of static water collected behind dams: no kinetic harvesting, practically speaking. I’ll make a rough guess and knock off a factor of two for the energy lost in the collection process leading up to the river/stream. My gut says that I’m probably being generous here. In any case, we’re dealing with something in the neighborhood of 6–12 TW of global potential. For the U.S., with 7% of the world’s land area, this turns into 0.4–0.8 TW. At present, the U.S. has 78 GW of installed hydro power (out of which we get 31 GW, averaged annually). The world has about 1 TW installed, likely realizing 400 GW on an annual average. The realized capacity therefore undershoots our crude estimate of global potential by a factor of 10 or more. Does this mean we could go nuts and expand hydro to amazing new levels? Should I ask for water skis for Christmas? Exploitable potential, considering environmental and other restrictions. For the first step, they come away with 5.8 TW—not far at all from my estimate (I’m not cheating I swear: I did not look at any estimates prior to writing the above sections). Other assessments get 4.4 TW, 4.6 TW, and 5.1 TW. For technical feasibility, these same sources estimate 1.6–2.3 TW globally. Economic feasibility (in today’s economic climate) drops this to 1.0–1.4 TW. Environmental restrictions (in today’s climate) reduce this number further. Thus, having developed 0.4 TW worldwide (using average annual output for proper comparison to studies), the world may be able to expand by a factor of 2–5. This is a large range: a factor of two isn’t that much, while a factor of 5 is a pretty big jump. Where is it, really? For the U.S., the Idaho National Laboratory estimates a gross potential of 0.3 TW, and a technical potential of 0.17 TW. The latter was determined after a study of 500,000 potential sites, out of which 130,000 made the cut. It is also estimated that existing dams with no hydroelectric capacity could add 0.013 TW (13 GW). So here in the U.S., we could expand by a factor of 5 according to this report—ignoring economic and environmental barriers. Such a boost would bring hydro up to 5% of our gross energy, or 12% if we correct for the heat-engine effect (40% of our electricity). I have seen other reports less optimistic about our expansion potential, coming in closer to a doubling of current capacity—likely factoring in economic and environmental considerations, and consistent with the lower end of the range estimated for global potential. At a global potential of approximately 10% of our current energy scale, my initial reaction is to throw hydro into the “niche” box with tidal, since my criterion is that a resource be theoretically able to meet a quarter of our demand to be labeled “potent”—which incidentally is in line with what oil, natural gas, and coal each deliver to us today: all are momentarily “potent” sources by this reckoning. If we consider that thermodynamic losses in conventional electricity production do not apply to hydro, we might be tempted to boost it into the “potent” category. But I didn’t need to do this for wind, and certainly not for solar. And even this boost does not put it over the top in the U.S. (at 12%), even if entertaining a 5× increase in hydro development. So I think I’ll leave it in the niche box. It’s a borderline call (and meaningless, really). Hydro beats the pants off of tidal, and is currently used to good effect the world over. But it’s a real stretch to make it a big player in the energy game at today’s rates of usage. Almost all renewable resources are dilute, and face substantial environmental hurdles for being adopted. Dams are not without controversy. They radically change the landscape and natural ecosystem. They silt up and lose capacity over time. And they can cause long-term threats to settlements downstream in the case of failure (and all dams will someday fail—they really haven’t been around that long). When push comes to shove, we may be willing to ignore aesthetic and environmental concerns. I might rather hike through Glen Canyon than listen to jet skis on Lake Powell (in the fossil fuel crunch, maybe I won’t have to), but weighed against the hardship of energy decline, will we collectively make that choice? Lake Powell already offers one answer. Of course dams require tremendous up-front (energy) investment, and therefore are susceptible to The Energy Trap. So in crunch time, I’m not sure I can predict what we’ll do, or if our choices will be at all rational. In hydroelectric power, we again face the problem that the impending fossil fuel shortage is not fundamentally an electricity shortage problem. So most of the “solutions” I’ve hit so far do not address the fundamental and most immediate crisis in liquid fuels. Overall, I’m a fan of hydro power, and I’m glad nature does most of the work for us. Nonetheless, my mind is not much eased by the joint facts that it falls far short of our current demand and that it’s yet another way to make electricity. It’s a gift from nature, but much like getting yet another tie for Christmas to add to the pile, I’m not getting excited about the prospect of more dams. Thomas Tu contributed research on hydroelectric installations for the table, and rounded up assessments of global hydro potential from a variety of sources. 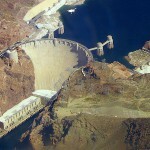 This entry was posted in Energy, Energy Scale and tagged hydroelectric, water by tmurphy. Bookmark the permalink. If you look at the economics, it’s obvious that hydro doesn’t have much room to expand. Hydro is by FAR the cheapest form of energy we have right now (in levalized cost). If there were more available, it would have been built long ago. Assuming we’ve built all the economically viable hydroelectricity already is assuming perfectly rational behavior from human beings. The INL report Tom references indicates the U.S. could economically double its hydro generation. My personal experience leads me to the conclusion that most Americans(energy-wise) will cheerfully leave a $20 (or $1000) bill laying on the sidewalk if that’s what everyone else is doing. I’m not saying that humans are perfect rational and efficient. But large corporations are pretty good about expanding to squeeze as much profit as possible out of their niche. It’s hard to imagine why people would just stop building hydro plants, after they’ve proven themselves profitable for more than a hundred years. Maybe you’re right, and they were all just being idiots and ignoring a chance to double their industry. My guess is that doing that would be horribly destructive to the environment, but say we do it anyway- hydro is such a niche power source right now that doubling it would barely make a difference. It would only get us an extra year or two of energy growth. A lot of those “licensing/political” issues are for a good reason though. I don’t want them to flood thousands of acres of farmland and deplete the water resources just to save a few cents on electricity- I’d end up paying it all back in higher food and water costs anyway. To say nothing of the people that would lose their homes, of course, and the ecosystems that would be destroyed. In your closing paragraph you note that our pressing problem isn’t energy per se, but the neat energy / storage package that petroleum offers that we use for transportation. I’ve been thinking a bit about that recently, and I think there may be cause for cautious optimism on that front. Two decades ago, the only place you’d find a hybrid petroleum / electric drive used for transportation was in a diesel locomotive or a submarine. A decade ago, you could buy a hybrid electric car…if you were willing to pay an “early adopter” premium — but plugin hybrids and pure electric cars were essentially nonexistent. Today, a hybrid motor has almost (but not quite) become as much of a standard option as an automatic transmission, and plugin hybrids and pure electrics are now in the “early adopter” premium phase. It seems not unreasonable to suggest that, in another decade, plugin hybrids and pure electrics will be the norm, and further that pure gasoline-powered vehicles will be rare enough in two decades that you’ll have trouble finding a gas station (regardless of what happens with oil prices). Right now, the extra load that vehicles place on our demands for electricity is negligible. But, if my guesses about the near future are right, that’s about to change in a big way. I have a hunch we’ll be looking to rapidly expand our electrical generation capacity. All of that is a long-winded way of leading up to my main point. The energy potential of these various sources is very important, as is (as I’ve asked previously) the (financial) cost to exploit them. But there’s another consideration, too: time to develop. It takes a very long time to build a dam — or a nuclear power plant, too, for that matter. And both are typically done on a very grand scale. It doesn’t take very long to build and install a solar panel — indeed, it can be done about as fast as and at the same time as the tie-in to the grid that any power production facility will need. I’m guessing it takes a bit longer to build and install a wind turbine, but probably not by a significant amount. And both solar and wind can be done at whatever scale best fits your needs. Petroleum and coal, I think, are somewhere in the middle — those GE turbines and boilers aren’t toys, but they’re only industrial-scale projects as opposed to environmental-scale ones. It seems to me that simple logistics are going to drive a lot of our real-world decisions, and, in this case, solar and wind would seem to have the upper hand. When (and if) solar ever gets as cheap as petroleum (or petroleum gets as expensive as solar), my money is on solar dominating the landscape from that moment on. You’re killing me with these long comments—and I don’t have time to edit down. But you make very good points. So I hope others aren’t put off by the length. I am also encouraged by the potential of electric/hybrid cars. At present, they are pricey enough to be in the realm of the elites. Will this change? Battery prices are not falling fast. As we struggle into the future, growth may falter and jobs will be hard to come by, so people may not be able to afford these newfangled contraptions. I hope I’m wrong, but I would have to see a much larger penetration of Volts and Leafs (have just seen a few) before I conclude it’s going to take off. Personally, I view the “electric” car as a dire threat to our future. If we merely adopt it without enacting a serious energy-and-infrastructure transition program, it is simply going to worsen the Energy Trap conundrum. Using personally-owned (and hence 95 percent idle) 3,358-pound machines (that’s the curb weight of the Nissan Leaf) to move people on everyday errands is wildly foolish, regardless of the fuel. Personally, I also fail to see why DTM wouldn’t be just as worried about the huge material expense of any serious adoption of electric cars as about the problem of conrete for dams. Mass adoption of EVs would use up a great share of the planet’s remaining lithium, and would also require a radical squandering of resources rebuilding the electrical system for cars, rather than genuine sustainable and vital uses. This has launched a series of comments on electric cars that I have suppressed. I let it go too long already. Sorry. I’m looking for comments on the post topic. If you want sprawling comment threads that meander any which way independent of original topic, I suggest The Oil Drum. Thanks for this analysis. My take on hydro was that it was already done. Your analysis roughly agrees. I hope we dont have to expand hydro too much more, I love salmon as a sport and the dams have already had such an impact on those majestic animals. I really like your planet scale analysis. Can you please do the math on nuclear energy? I am wondering what the total available energy is for nuclear energy (fission). Also if you could comment on fusion that may interest your readers, my take is the neutron balance precludes scale down of fusion to “human scale”. The sun and stars do work nicely though. thanks * 1e6 for your blog. I really really enjoy reading it. The thing with hydro is that all the low hanging fruit has been picked already. Most of the remaining sites have bigger problems. As Cyrus mentions, they impact salmon. Here in BC they want to flood a new section of the Peace River and destroy more farmland. And when fossil fuels become more expensive, then our remaining agriculture will become more precious because of the 10 to 1 energy requirement to produce a Calorie of food, as Tom has previously explained. Food production is going to be a major problem in the future when we hit the fossil fuel crunch, so these environmental externalities of hydro development can’t be dismissed. In BC they also deregulated a lot of the run-of-river hydro development over the last few years so it’s easy for companies to go into unspoilt wilderness on public lands and put in these projects. They disturb the river and intrude into the natural landscape, bringing with them lots of problems. And all of this expanded hydro development is for naught because all it’s done is allow our economy to expand! And our economy is expanding around increased oil, gas, tar sand, and mining extraction — all unsustainable activities. It makes no sense. Tom you have mentioned installed capacity in a couple of articles now, but I’m a little confused on its exact meaning. Can you explain? Each hydro plant has a rated capacity based on its installed generators. The plant will only operate at capacity during some parts of the year. But if you total up all the “nameplate” capacities from all the plants, you get 78 GW for the U.S. Over the course of a year, our hydro plants are used at 40% capacity, so they act as if we only have 31 GW of 24/7 operation. One point that hasn´t been mentioned is the potential synergy between hydroelectric power and other more intermittent renewables. Typically the water turbines can respond quickly to changes in demand, and assuming that the water level behind the dam is in the normal working range then the output can be varied at will. Toms´piece has already pointed out that most installations run at 30% (ish) of nameplate capacity, implying a large potential for short term extra production; conversely if other renwable sources are having a good day then production could be lowered to a minimum. In fact in some cases the turbines can run in reverse and give us a storage option. Some dams are run under tight regulation, e.g. a minimum flow mandate or an irrigation or flood control requirement but even so I think there is still some potential for significant increases in hydros´contribution to the energy mix. As part of my sustainable energy course this year, the Itaipu Dam project came up, in the same league as Three Gorges. It supplies rural Paraguay with most of its electricity. While the other half of the output supplies 20% of Brazil’s requirement, I’d guess supplying the grid for industrial Sau Paulo. That’s quite impressive. And now I know why some folks favour Paraguay as a post-Peak Oil bolthole! I understand from a friend who visited Itaipu that Paraguay’s surplus energy generated is it’s biggest export earner – the ownership split is 50/50 but significantly more than 50% of the output goes to Brazil. This was about four or five years back but wouldn’t surprise me if it’s still true! Concrete production is at least 5% of global green house gas emissions, and the inundation of the land for reservoirs releases tremendous amounts of methane. This is only true of tropical reservoirs which flood forested land. Here’s a report discussing this: http://www.agu.org/pubs/crossref/2011/2010JG001465.shtml. Nevertheless, it’s an important consideration for new hydro projects. As noted, most of those dams listed above are here in Washington State where electricity is very cheap and you can feel pretty good about using it. But, I guess not good enough because Bonneville Power who supplies most of western Washington with their electricity is developing wind power at a significant rate. Bonneville would like to keep the dams to use as back up, but there are many who would like to tear them down, in fact one smaller one was recently torn down. Since, most of the hydro power in the U.S. is located here and we are beginning to choose other power sources (wind), and are even thinking of tearing down our dams, it doesn’t seem plausible that hydro will be ramped up anytime soon elsewhere in the U.S. It seems wind is the winner, here in Washington anyway. Just to put your comment in perspective … its THE CHEAPEST in the nation on average (for August 2011). It’s great to see both these thoughtful articles, and your moderation of the ensuing discussions. I appreciate how time consuming the latter can be… but it is critical to avoid diluting the discussion with endless drivel. I think that your “box” (niche or non-niche) strategy is perhaps unfair to some of the various means of generating electricity (or I could be misinterpreting your meaning). Coal and natural gas are clearly non-niche, but both are undesirable from a resource depletion and CO2 emissions perspective. Building more nuclear capacity is an option, but one fraught with profound political difficulties, as well as real safety issues. All the other options are currently niches, but have the ability to grow, with PV being likely to experience the highest growth rate. There is no single niche that, by itself, will solve either depletion or emission issues quickly enough. There is no single niche that can grow at a rate close to adequate to fix just the emission issues, unfortunately. If I knew educated people who have read the IPCC reports and who say “Oh, don’t worry, Bill O’Reilly says we’re OK,” then I wouldn’t worry about climate change. I don’t know such people. I’ve read the reports. Things don’t look good. In the US, we are not taking meaningful action, and perhaps poo-pooing various energy sources as niches makes us even less likely to take action. People want simple answers before they take action. There are no simple answers. Hard spot. The practicality of expanding solar power is demonstrated by many Leaf owners, who sell PV power to the grid during peaks and buy power off-peak to charge their cars. That arrangement can be very cheap for them, helps the power companies avoid capital expenditures, and avoids CO2 emissions that would otherwise be created in by transportation and for other uses. Better to power peak industrial loads with Harry’s solar panels than with West Virginia’s coal. The solar niche can grow, I think. Hydro can grow, slightly, too. As can wind. All the niches need to grow, because the non-niche possibilities are the problem. My boxes are meant to apply to the ultimate resource: not what they happen to be today. Tidal cannot grow out of niche. Hydro cannot grow out of niche. This is assuming we manage to pull off a future at today’s energy standards. If we see serious decline, some of these things could scale into a large fraction of the (reduced) total. That said, I think you both make very valid points. So I doubt that any more dams will be built in the Western United States: the choice sites already have dams, and many existing ones are slated to be dismantled. Dams also share a problem with nuclear power plants: how might a deindustrialized society of the future successfully dismantle or repair dams if they lack access to fossil fuels or complex specializations or tools? While not everyone will agree with John Michael Greer’s “ecotechnic future/catabolic collapse” theory, I’ve seen precious little discussion about the long-term future of dams and their reservoirs. Here’s hoping that the environmentalist community doesn’t wreck us by blocking/destroying low-emissions power sources like hydro/wind/solar in favor of BAU natural gas plants. The choice sites are NOT all taken, that’s propaganda, see the study Tom linked. Nuclear fission is our “pony.” Do you think we deserve it? It looks like we’ll be working up to it by building a few tried-and-true light water reactors over the next decade or so, even though uranium supplies are not guaranteed. Maybe if we survive to 2030 or so, we can start rolling out the fast reactors, after our economy has dramatically changed. So I want to see you do nuclear fission. This is the only thing that will actually work. Agree that advanced breeder fission/fusion are often presented as ‘pony’ solutions – and would be interesting to see some concise estimates here – but it’s not true that they’re the only thing that will ever work! Given the readers of this site, I’m really interested to know if anyone would be prepared to make a substantial ‘long bet’ on the future potential of solar pv 🙂 Have just finished some analysis and will be turning it into a post over the coming month or two – my contention is that there are solutions available with existing/near-existing technologies that give us abundant clean energy at minimal incremental cost, using solar and storage that is easily locatable and scalable to well in excess of 30TW. We risk running off on a nuclear tangent here, so I will stop the thread here (perhaps should not have allowed it to start?). I will certainly be doing a nuclear post in the future. But Dojomouse also raises an interesting idea: to give readers a chance to “go nuts” on comments. I’ll make a special post to serve as a reader’s forum. I’ll take off the usual brakes w.r.t. moderation, though still putting a priority on civility. Stay tuned. I’m writing this using a few Watts of on-site off-grid pico hydro – a 1000W low head (2m) no-dam Francis turbine plus 2kW of PV and a few kWh of “flywheel” battery deliver all the power I need for my home and home office 24/7/365. Niche? You bet. Running a 2011 household with a 2hp recycled induction motor and three capacitors? Priceless! Bill – I love renewable microgrids, but while there are numerous examples of small efficient living it doesn’t really change the bulk energetics. The global target of 18TW in 2030 would have everyone limited to 2kW each TOTAL. So, not only is it not possible for everyone to have a small head hydro plant and live a peaceful existence off-grid (in fact the opposite is perhaps our best hope for an efficient low-emissions lifestyle while freeing up the natural world for other species) but even the ambitious energy generation targets probably still have the global average consumption LESS that what you’re provided by your microgrid. Have to remember that the anticipated 2kw/person globally includes all food, state provided services, travel, flight etc. My household electricity and heating comes to about 500W averaged over a year. This was less than 5% of my consumption in 2010 (though this year I flew a lot less which would help). Glad to see you did a bit more research into the available studies of potential U.S. hydropower, and I appreciate the top down estimate. Just a note that a USACE (the people who build federal dams in the Eastern U.S.) study showed the potential at 580GW (which I would take as an upper bound estimate given the source). Also, most of the difference between 300GW and 170GW in the study you reference had to do with excluding sites based on political, not technical, grounds. Even so, your adopted bottom-up estimate is of a 5-fold feasible increase. Note that the height of the dam is not an accurate means of determining the design head. Many dams have reservoirs on both intake and outfall, reducing head. Also, as you know, many smaller dams have penstocks which travel far below the bottom of the dam, increasing head. For instance, some small high head hydro installs may have 500 meters or more of head, with a dam height of a few meters. Note that in arid areas, more of rainfall is absorbed or evaporates than becomes runoff, which may be skewing your top-down analysis upward, and would reduce your answer. Google says mean land elevation is 840meters, which would increase your answer. Also, some areas drain to lakes below sea level (Dead Sea, Caspian Sea, etc. ), which would increase your answer. Unfortunately, other endorheic lakes are above sea level., which would decrease your answer. Awesome additional info, thanks! Especially glad to know the 840 m number. Good point about evaporative/absorptive influence. The problem with top down estimates of energy are the assumptions of how much potential energy can be captured. With wind and hydro it is not clear how much of that 23% solar energy used in evaporation translates into generating low pressure weather systems( a major driver of winds) versus raising water and depositing at higher elevations. In contrast using a bottom up approach we can measure existing wind and hydro and extrapolate to all potential sites. With hydro we would not expect much interference between sites. The perceived problem with wind is the down-wind effects of greatly expanding existing wind farms. I would note that a wind farm only extracts a very small portion of the energy that passes across a wind farm in the lower 150m (about 3%) and this is only a very small portion of the energy in the 10km air-mass. This leaves room for very small re-charging by wind shear to fully restore any energy extracted by the wind farm(less the lower energy now extracted by the ground surface). I would suggest that most existing wind farm sites and developed hydro are not located at the best sites, but at sites located closer to electricity grids. Case in point, Alaska has 45GW potential; hydro(none developed), much of Canada’s undeveloped potential is in sub-arctic, and very little of Africas very considerable potential has been developed. For wind, the best locations in UK are in northern Scotland but most wind farms are located in England. If a lot more of you estimate of only 0.15W/m sq of the 17W/m sq for potential wind power can actually be harvested, then wind energy could be like solar a very significant replacement of FF en energy The difference is that some windy locations have considerably higher energy concentrations than the best solar locations. I’m pleased to see hydro relegated to niche (and justifiably so). Am currently reading this book (http://site.whenabillionchinesejump.com/) and it provides, among other fantastic insights into the environmental crisis in china (and, by extension, the world), a really damning (haha!) overview of China’s history with hydropower. Collapse, silting, flooding, etc etc etc. They have devastated landscapes and ecosystems, and killed hundreds upon hundreds of thousands of people. A further limitation in capacity which I don’t think has been mentioned yet is geological suitability – you don’t only need a height difference and water and a dam, you also need the geology of the area to tolerate having a massive addition of water. This is hugely destabilizing of existing geological structures – can trigger earthquakes, landslides etc quite aside from the obvious flooding and vegetation/wildlife destruction. This is an appropriate point to mention an issue I didn’t raise back in the post on pumped hydro – I assume your numbers for stored energy potential assume that the dam can go from full to empty in the seven day period you mention Tom? In reality trying to do this would require an extremely stable underlying structure which is definitely not the norm. In most dams, removing such an incredible mass over a small area would lead to geological uplift certainly, earthquakes certainly, and landslides certainly. Any of these events could easily destroy the dam itself. This is another part of why dams are usually operated over quite a narrow range of reservoir depths in cases (i.e almost all) where existing geography provides a lot of the containment structure. Just a thought. Mention has been made of the enviromental downsides of dams and that some are in line for decommissioning. Are there any studies on the environmental effects of the deommisioning process itself? Interesting post. I’ve always wondered if countries and regions with a large, mostly already realized hydroelectric potential, like e.g. Norway and Austria, would fare better in a fossil fuel crunch. The up-front energy investment has already been made in times of cheap fossil energy and the dams and pumped-storage facilities will continue to generate relatively cheap electricity even if fossil fuel prices skyrocket (and yes, dams do silt up, but that’s why they’re flushed every 10 to 20 years, which removes most of the silt). It might be an advantage if you don’t have to worry too much about electricity when fossil fuels become scarcer and more expensive. Also, electricity is what makes trains run (at least where I live), so increasing costs for truck and car transport can be partially offset by passenger and freight trains. Also, while it’s true that the best sites for large-scale hydroelectric power are already in use, there’s still a lot of unrealized potential for small and medium hydro plants. They have a much smaller impact on the environment and landscape, which means they’re not really controversial, and the up-front investment is much smaller as well. Personally I would place hydroelectric power in the same niche as geothermal power: Both have a very high potential and can cover most or all electricity needs – as long as you are in the right place. As I understand it, most of the hydro plants in California act as peakers – they have the ability to rapidly spool up and down based on load requirements, much more so than coal, gas or nuclear generation plants. Here is a graph of the generation outflow from Shasta Dam (the largest reservoir in California) for the last 365 days. Outflow ranged from 2000 CFS to 17,000 CFS throughout the year. Similar data is available for all the dams in California. New to DTM … got the link from the sidebar on The Oil Drum on a slow news day. I am very interested in Hydro, so I will be going back through your old posts. I work in a small town (~30k people) in Alaska with 100% hyrdopower (diesel back ups). This system was recently expanded (less than 10 years ago) to accommodate population growth. I think people should consider moving to where the “green” energy is rather than maintain the expectation that scientific advances will bring the solution to them (hint: it won’t). For the record I work in applied CompSci and there is plenty of skilled work here if one bothers to look (engineering, medical, etc).